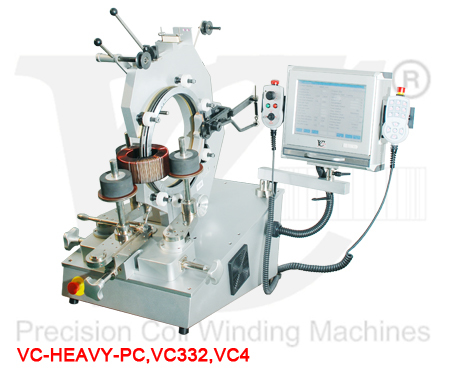 The VC-HEAVY-PC is a Hi-Tech bench machine with PLC control and PC with touch screen and incorporates VC's flexible system with interchangeable heads and roller tables. It is designed with servo motor for head drive and servo motor for core drive. The user friendly software guides the operator thru the programming with clear grahpical screens. Typical jobs for the VC-HEAVY-PC are general and heavy duty applications. The machine is very strong and heavy and it has a powerful SERVO MOTOR with 1.5KW for the head drive,therefore, it can handle thick wires at high speed. VC Machine Software runs on all standard XP PCs.